The Iowa Barnstormers open their 2010 season “Back Where They Belong,” as they re-join the Arena Football League. 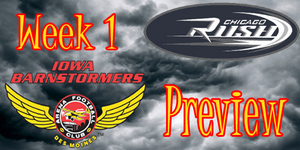 The Barnstormers will take on their first opponent, The Chicago Rush, on Friday April 2nd on Wellmark Field at 7:05pm. The Rush return to the field after going dark during the one year hiatus of the original AFL. Chicago has been a standout team since joining the league in 2000 as they have qualified for playoffs in their nine years in the AFL and won one championship in 2006. Led by Coach Mike Hohensee, the Rush lead the series 2-0 over the Barnstormers and the two teams have not faced each other since 2000. With 14 spots on the active roster filled with members of the 2009 af2 Barnstormers, this will be a chance to prove their talents over a team with more AFL experience. A big question that will be answered opening night will be the starting quarterback. Will Coach Gregory go with his starter from last year in the af2, Brian Villanueva, who led his team to a Midwest Division Championship, or will he go with Ryan Vena who was brought in from the Wilkes-Barre/Scranton Pioneers where he led them to two af2 arena cups as well as having AFL experience. Villlanueva is more familiar with the Barnstormers offensive scheme, but both Quarterbacks have fought hard for the starting position throughout camp. It will all come down to the decision Coach Gregory makes opening night. -Todd Blythe: This former Iowa State standout will show how well he been able to transition to 50yd indoor field. While he was a part of the CFL briefly in 2009, this will be his first time playing in the regular season since he graduated in 2007. Blythe will not only bring an incredible amount of speed to the receiver corps, but he will bring height with his 6’5 stature. -Jesse Schmidt: After ranking at or near the top of all receiving categories in the af2, Schmidt joins the Barnstormers to pick up where he left off last year. Last year with the af2 Quad City Steamwheelers, Jesse averaged almost 150 yds per game and over 110 yds the previous year. Schmidt was also named Big Game Playmaker of the year and named First Team All-af2 by the league in 2009. Along with Blythe, Schmidt brings needed height to the Barnstormers receivers that they have not had as much of in the past and will be able to show how they can utilize having these two players as a major offensive weapon against their opponents. -Khalil Carter: As the player with the most AFL experience on the active roster, Carter has shown he has the ability to lead a very young and tenacious defense. Carter has had great numbers throughout his career in tackles, interceptions, and defensive touchdowns. Having Carter in the secondary can only improve an already stellar group that includes returning starters Varner and Simpson. This trio will undoubtedly create problems for any opposing quarterback. Don’t forget to get your tickets to opening night! Tickets start at just $15 a seat; call the Barnstormers Front Office TODAY: 515-633-2255! This is also the first of four home games that will be broadcast live nationally on NFL Network.